"The Life of Kahalaopuna and Other Tales of Love Gone Wrong"
Love doesn’t always last forever. Come listen to the haunting tale of Kahalaopuna, the young princess of Mānoa and other stories of love and jealousy—and the supernatural. 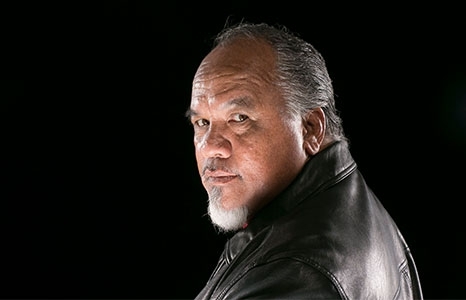 Lopaka Kapanui is a native Hawaiian storyteller, writer, actor, kumu hula, cultural practitioner, former professional wrestler, husband, father and grandpa. Lopaka has been hailed by Honolulu newspapers as one of Hawai'i's foremost storytellers, sharing tales of between-world spirits and Hawaiian mythology to anyone who'll listen. For more than a decade, he has led after-dark ghost tours around the island of O'ahu. A storyteller for more than twenty years, hundreds of people have come forward to share their own stories with him, making him a repository for some of our islands' spookiest tales. Sharing more than just Hawaiian ghost stories, Lopaka shares his knowledge of the history and legends of O‘ahu and Hawai‘i. With his theatrical, mesmerizing style, he offers fascinating glimpses into Hawaiian spirituality.